Louis E. Martin majored in English at the University of Detroit and received a master’s degree in English in 1954. He also earned a master’s degree in Library Science at the University of Michigan in 1960. After graduation, he taught in the English Department there, and was subsequently appointed circulation librarian. After serving briefly as assistant librarian at Oakland University in Michigan, Martin was appointed as Associate Director of Libraries and Associate Professor of Bibliography at the University of Rochester. From 1968 to 1972, he joined Stephen McCarthy at the Association of Research Libraries as Associate Executive Director. In 1972, he became Librarian of Harvard College. 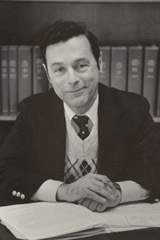 Martin came to Cornell as Director of Libraries in 1979. In 1981, he was named the first Carl A. Kroch University Librarian of Cornell University, one of the few endowed librarians’ chairs in the country. During his tenure, the Library joined the Research Libraries Group (RLG) and began to enter catalog records into the Research Libraries Information Network (RLIN). In 1985, Martin resigned from Cornell to accept the position of Director of the Linda Hall Library in Kansas City, Missouri, a distinguished specialized library in the fields of science and technology.